Nebraska typically ranks between 10th and 20th in total potato production among states. 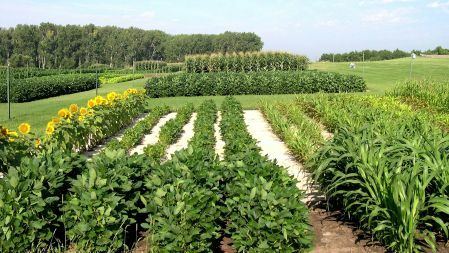 According to the USDA National Agricultural Statistics Service, Nebraska potato growers planted 19,500 acres in 2008. Production totaled 8,432,000 hundredweight, with an estimated value of $80.5 million. The Potato Education Guide provides help with all aspects of potato production. Nebraska is among 11 states and two Canadian provinces involved in sugar beet production. In the Panhandle of Nebraska, beets have been grown since the early 20th Century. Nebraska ranks sixth in the U.S. in production, with 45,000 to 60,000 acres planted per year, and a high of 80,000 acres in 2000. Sugar beets contribute an estimated $130 million or more to the western Nebraska economy through payrolls, property taxes, and other impacts. Sugar beets, a major contributor to the U.S. sweetener industry, are used in a broad range of products. Worldwide, about 35 percent of production comes from sugar beet and 65 percent from sugar cane. In the U.S. about 50 to 55 percent of the domestic production derives from sugarbeet. Please see the Sugar Beet Section for information on production, disease management, weed management, soil management and other topics. According to the 2012 Census of Agriculture, approximately 26,978 acres in Nebraska are devoted to commercial fruit and vegetable production, including crops such as tomatoes, peppers, watermelon, sweet corn, tree fruits, small fruits, nuts and many more. Many producers are small growers selling directly to local clientele through farmers markets or roadside stands. Americans are eating more fresh produce than ever, thanks to nutrition education, with a more than 20-pound-per-person increase over average consumption 20 years ago. The Food Safety Modernization Act (FSMA), signed into law in November 2011, aims to strengthen the United States food safety system by preventing foodborne outbreaks before they occur. The Produce Safety Rule, one of seven major rules under FSMA, requires fruit and vegetable growers to meet science-based minimum standards for safe growing, harvesting, packing and holding of fruits and vegetables grown for human consumption. FSMA also establishes a national center and four regional centers to help guide growers that will have to comply with the law. Nebraska Extension Educators Sarah Browning and Connie Fisk represent Nebraska growers on the North Central Region Center for FSMA Center for Training, Extension and Technical Assistance. For more information on how FSMA will affect your farm, contact Sarah or Connie. It's important for growers to understand that their production practices play a role in the prevention of food borne illness associated with fresh produce. Contamination of produce may occur at any stage of production— field or greenhouse growth, harvest, post-harvest handling, transportation, or consumer use — but there are many things that can be done to reduce risk. Developing a good farm food safety plan and implementing Good Agricultural Practices (GAPs) are the best ways to ensure the safety of your customers and your business. Variety Test Results for dry beans, oats, millet and sunflower.